Torta Rogel is an authentic Argentine recipe. 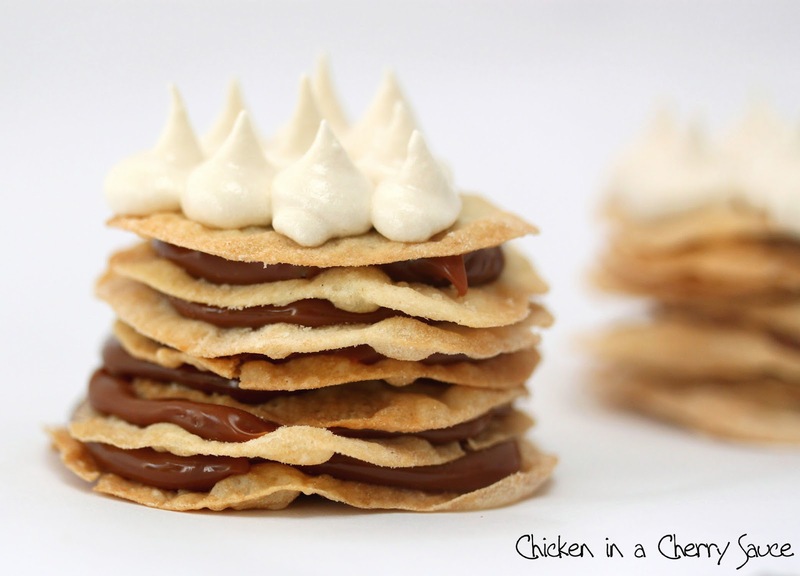 It consists of layers of crispy pastry sandwiched between glossy dulce de leche and is topped with Swiss meringue. When I was in Argentina I made this cake with one of my Argentine friends. She gave me a 1kg pot of dulce de leche to take home to make this dessert for my English friends and family. Many people make Torta Rogel using the same dough as empanadas or they use pre-made empanada discs that I mentioned in my Empanada post. This is such a simple dessert that I didn't want to take any shortcuts. I don't think that England sells empanada discs, anyway! I researched many different recipes, in both Spanish and English, and combined them to create my own. Mix the butter and flour together until a breadcrumb-like texture is formed. Add the egg yolks and water and mix to form a dough. Divide the dough into walnut-sized balls, wrap them in cling-film and then leave them to rest in the fridge for 1 hour. Roll out the dough balls on a floured surface to a thickness of ~0.5mm. Place the sheets on a baking tray and prick the pastry all over with a fork. Bake the sheets at 180°C for ~5 minutes until they are lightly golden brown. Sandwich 7 or 8 baked pastry sheets with spoonfuls of dulce de leche. 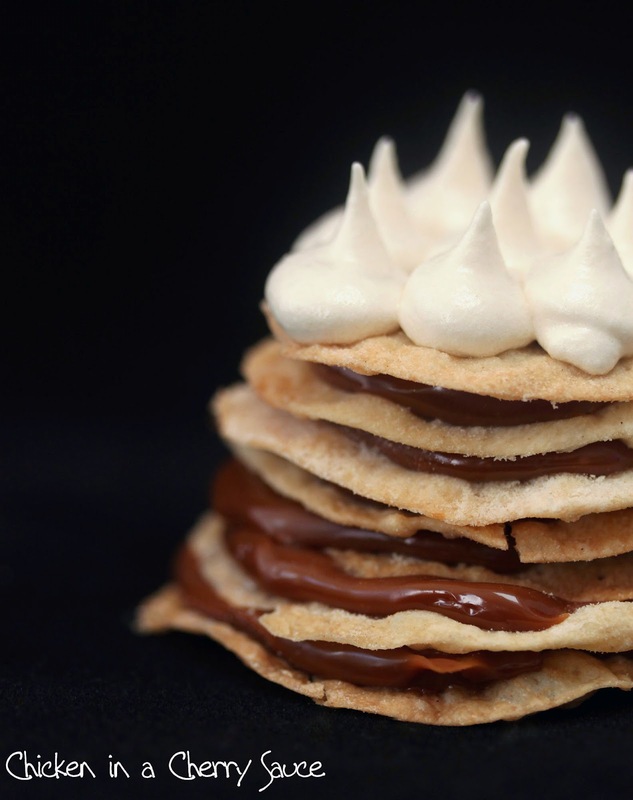 It may be useful to heat the dulce de leche slightly to soften it and make it easier to spread. Lightly whisk the sugar and egg whites over a low heat. As the mixture warms, whisk harder until stiff peaks are formed. Place the meringue into a piping bag and pipe little peaks of meringue on the top pastry sheet. This recipe makes 38 walnut-sized dough balls which, in turn, makes 5 cakes. I decided to make 1 cake and several "rogelitos" (mini-cakes) by dividing each pastry ball into 5 smaller balls to make smaller pastry sheets. If one wishes to make one cake, I recommend quartering this recipe. Although this recipe is simple, the rolling out of the pastry sheets and cooking them tray by tray does take some time. These are best eaten fresh, however, they can be stored for a few days and heated up for a few minutes in the oven before serving. Mezclar la manteca y la harina juntos hasta conseguir una textura como de miga de pan se forma. Añadir las yemas y el agua y mezclar hasta formar una masa. Separar la masa en bolas del tamaño de una nuez, envolverlas en film transparente y dejar a descansar en la heladera durante 1 hora. Estirar entonces las bolas de masa sobre una superficie enharinada hasta un espesor de 0,5mm. Colocar las hojas en una bandeja de horno y se pincha la masa por todas partes con un tenedor. Hornear las hojas a 180°C durante aproximadamente 5 minutos hasta que estén ligeramente doradas. Intercalar las hojas con cucharadas de dulce de leche. Batir las claras y el azúcar impalpable suavemente calentando en fuego bajo. Cuando esté caliente, batir mas fuerte hasta que este dura a punto de merengue. Rellenar una manga de decoración con el merengue y formar picos encima de las hojas con dulce de leche. Esta receta hace 38 bolas de masa, que hacen 5 tortas. Me decidí a hacer una torta y varios "rogelitos", dividiendo cada bola en 5 bolas más pequeñas para hacer pequeñas hojas. Aunque esta receta es simple, el estirar y cocinar de las hojas requiere mucho tiempo. Estas tortas se comen mejor frescas, sin embargo, pueden almacenar durante unos pocos dias y se calientan durante unos pocos minutos en el horno antes de servir. The pastry is very crumbly and delicate. The idea is for the pastry to crack as one adds the layers together and the sticky dulce de leche to act as a glue holding each layer in place. 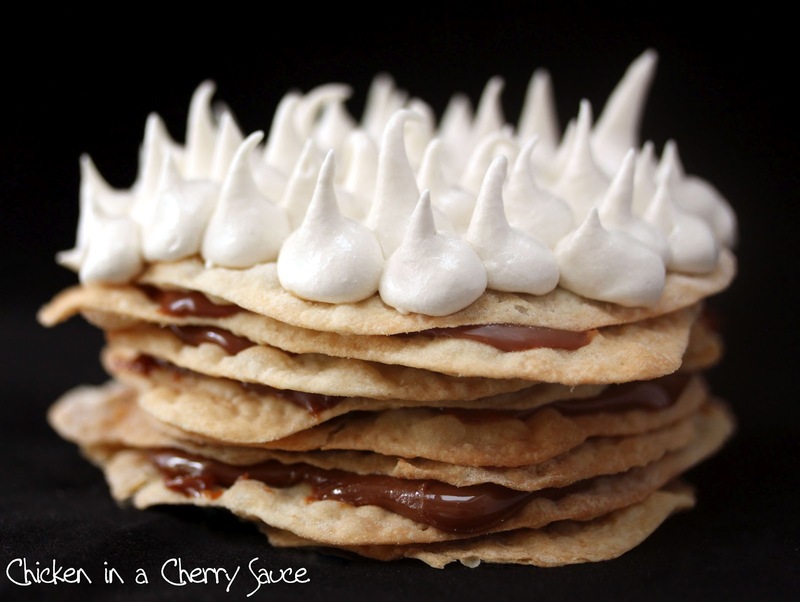 The Swiss meringue is quite different from normal meringue since it holds a mousse-like texture. If one prefers, the meringue can be hardened on a low heat in the oven for 30 minutes or so. The cakes will survive a low temperature in the oven. Slice like a normal cake and enjoy! I have never heard of this dessert before.....it looks truly amazing. I love those fabulous layers, this definitely looks like a dessert for sharing. The Italian Meringue looks perfectly piped too. These heavenly layer are amazing! Mouth watering flavors and so pretty too! That looks soooo good it should be illegal! It looks delicious & pretty. wow this looks amazing!! 1kg of dulce de leche? Yum! That's a seriously impressive-looking dessert. 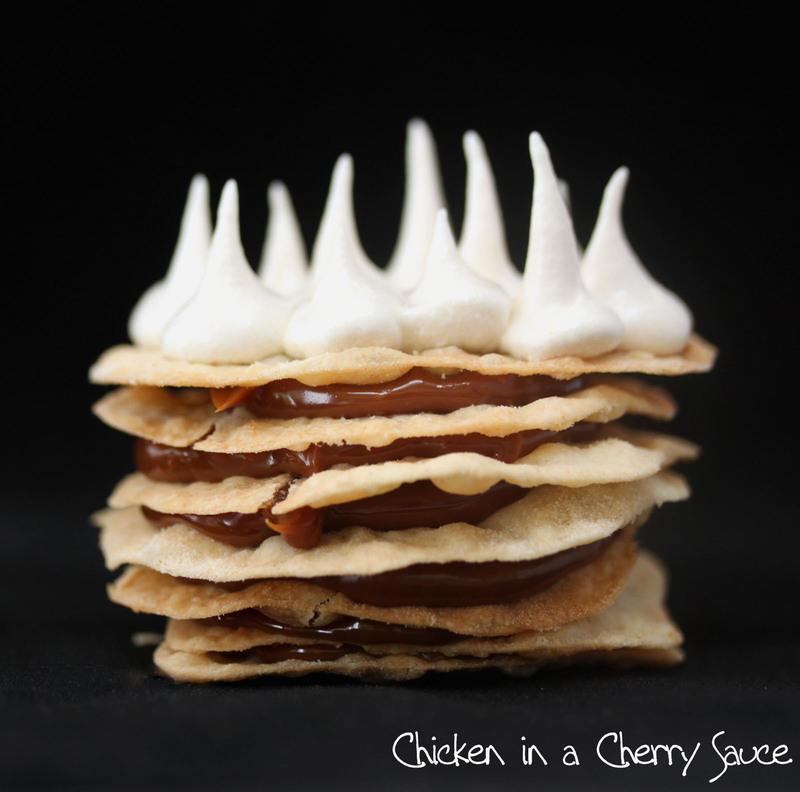 I love the way that meringue tops it off. I suppose you have to have a sweet tooth and luckily I certainly have. A wonderful speciality! Really delightful and sinful. You are so lucky to receive such a great gift from a friend. I would love to receive 1kg of DDL! LOL! 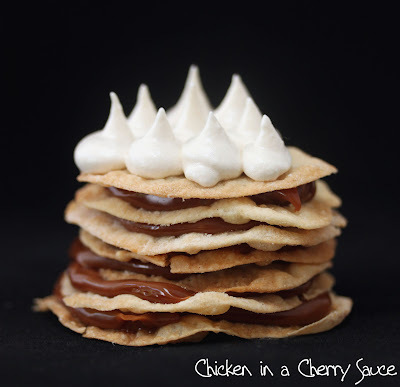 This looks extremely delicious with a wonderful combination of sweetness, crispness and creaminess. Yum! Hazel, this looks magnificent! If someone had given me a 1kg pot of dulce de leche, I would probably have scoffed it straight out of the jar. Now this looks like a dessert to really wow your dinner party guests - amaaaaaaazzzzzing! just trying to imagine a 1 kg pot of dulce de leche. 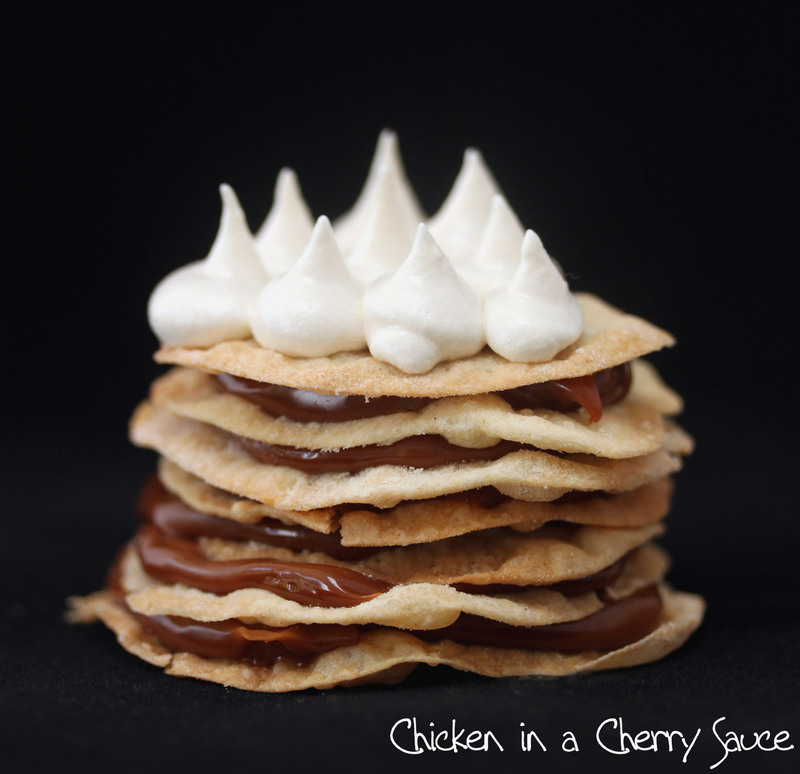 I've never seen or heard of this dessert but anything with dulce de leche sounds fabulous. That looks like something you would get in heaven, lol... amazing! The way in which you make the meringue is the method used for Swiss Meringue not Italian. You're right! Thanks, I will change it. 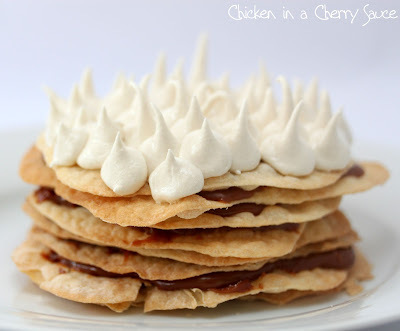 It´s the worst made rogel cake i've ever seen, if this looks amazing wait until you see a real one! Thanks for your comment, I always welcome any form of feedback. Would you be able to share a link of some real ones to see how I could improve?